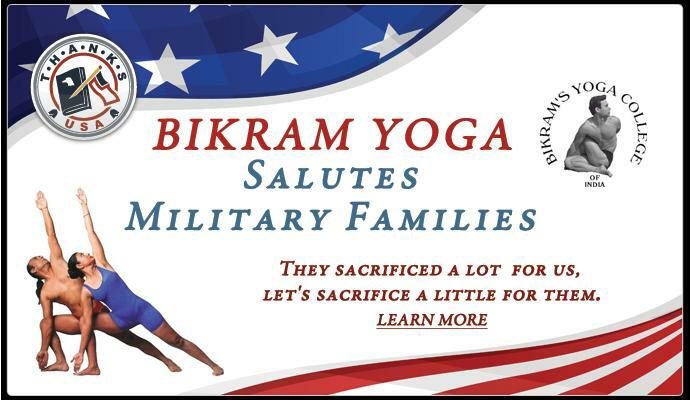 McLean, Va., April 29, 2011 – A former Army Ranger and now a recognized Bikram “Hot” Yoga instructor has taken on a new role: to provide educational opportunities for military families. Jim Ambrogi, a wounded veteran of Vietnam and Operation Desert Storm in Iraq, is launching a fundraising campaign for ThanksUSA, a charity that provides the families of military men and women with needs-based, post-secondary school scholarships. Ambrogi will devote all of May – National Military Appreciation Month – to fund scholarship awards through donations, drawings for yoga mats and outfits, and prizes offered by local businesses. Ambrogi’s new initiative fits well with “Joining Forces,” the national program announced April 12 by First Lady Michele Obama and Jill Biden, wife of the Vice President. They are calling on all Americans to “to mobilize, take action and make a real commitment to supporting our military families,” Michele Obama said. Ambrogi will center his campaign at his Bikram studio in Alexandria, VA. Bikram yoga involves strenuous poses and stretches, completed at 105 degrees Fahrenheit. During May, Ambrogi is asking his students and fellow yogis to stretch open their wallets, too. Ambrogi is also challenging other Bikram studios nationwide to follow his lead and join his campaign by developing their own fundraising efforts. “Our families back home sacrifice as much as any of us on the battlefield. I’m confident that other Bikram studios, along with my students, will also want to help military children and spouses through the gift of education,” Ambrogi continued. A native of Massachusetts, Ambrogi enlisted in the Army at the age of 20 and served for 22 years. A marathon runner and body-builder, he suffered several combat injuries, which required several surgeries, leaving him with a 60 percent disability rating from the Veterans Administration. It was then that he turned to Bikram, becoming one of its top masters and later introducing the “hot yoga trend” to the Washington, D.C. region. 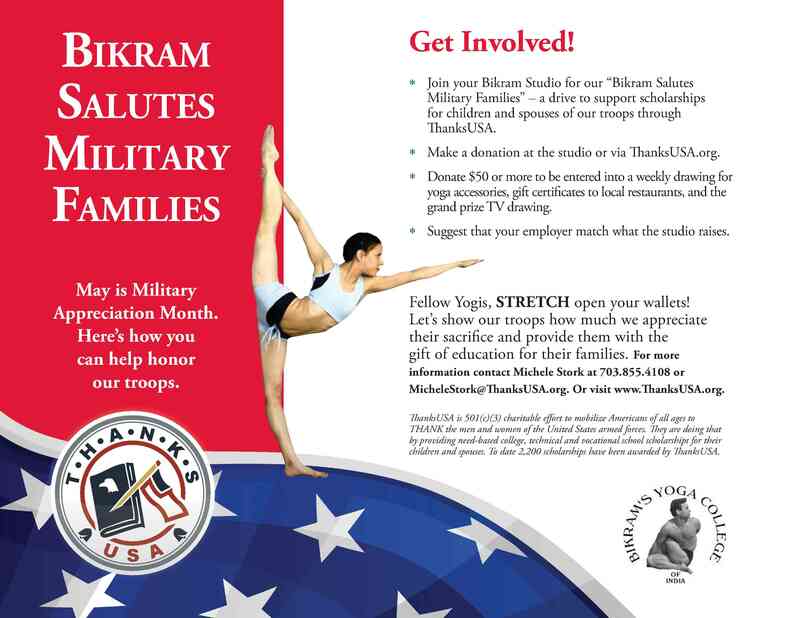 The founder of Bikram yoga, Bikram Choudhury, sees the studios’ effort to support military families as an extension of their work. “Our studios have helped to heal wounded warriors in many communities, and we would like to also support their families through ThanksUSA,” he said. Since its inception in 2006, ThanksUSA, a 501(c)(3) non-profit, has provided over $6 million in academic scholarship assistance to America’s military families throughout all 50 states, with particular attention given to those whose loved one was killed or wounded in action. ThanksUSA’s scholarship program is unique in that both spouses and children of active-duty men and women can apply to the same organization for support. The scholarships directly benefit those who most need and deserve the opportunity to transform their lives, but lack the resources to do so. Recipients represent all military branches – Army, Marine Corps, Navy, Air Force, Coast Guard, National Guard and Reserve – and come from each of the 50 states and the District of Columbia. As Jim Ambrogi and so many others understand, ThanksUSA offers much-needed hope and encouragement to each member of America’s broad military family and a visible role for supporters to re-invest in a resilient military community and a stronger America. To learn more about ThanksUSA, visit www.ThanksUSA.org.